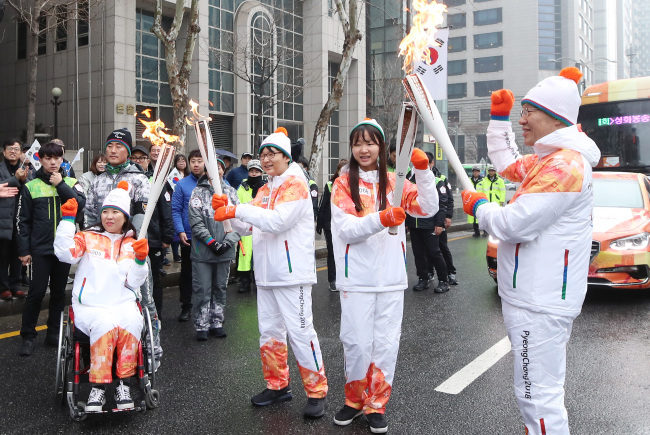 Two thirds of South Koreans don't know the opening day of the Winter Paralympic Games in their country, a survey showed Monday. According to local pollster Realmeter, which last Friday asked 500 adults about the opening day of the 2018 Winter Paralympics, only 33.6 percent of them answered correctly. The PyeongChang Winter Paralympics run from March 9 to 18 in PyeongChang, some 180 kilometers east of Seoul, and two adjacent cities, Gangneung and Jeongseon. The survey showed 13.5 percent picked March 5 as the opening day of the Paralympics, while 10.1 percent and 8.2 percent selected March 12 and March 1, respectively. It also showed 34.6 percent answered they don't know when the PyeongChang Paralympics exactly start. By age, respondents in their 30s and 40s were more aware of the Paralympics opening day than those who are in their 50s and 60s.